The Employee Recommended Workplace Award is the only award of its kind that is based entirely on feedback from employees. The award program was developed by the Globe and Mail, in partnership with Morneau Shepell. 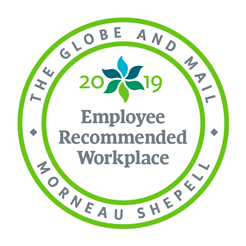 This special designation recognizes employers with excellence in achieving a healthy, engaged and productive workplace. InvestorCOM was evaluated by employees on four components of total health – physical, mental, work and life – and their impact on engagement and productivity. Sarah Eagles, Director, People & Culture. InvestorCOM (www.investorcom.com) provides financial technology and outsourcing services to banks, asset managers, insurance companies and investment dealers. We have developed an innovative suite of FinTech solutions in response to increasing regulation and the demand for more effective communication and disclosure from the financial services industry. We are your bridge to a digital tomorrow.